WASHINGTON, D.C. -- "My spirit is as strong as ever. 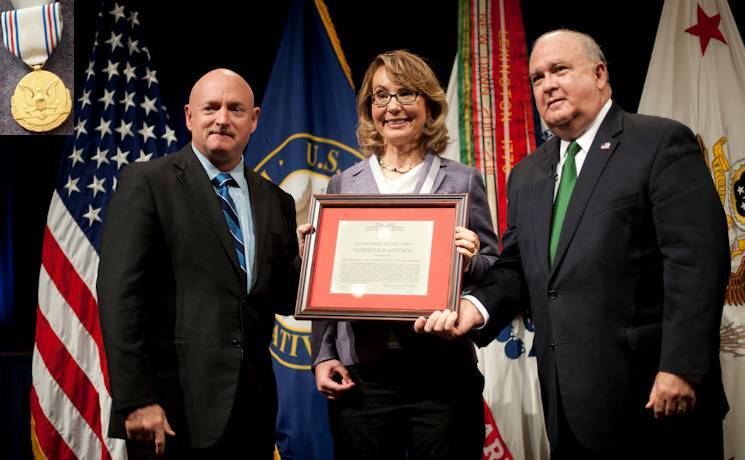 I'm still fighting to make the world a better place," said former U.S. Representative Gabrielle "Gabby" Giffords after being awarded the Department of the Army Decoration for Distinguished Civilian Service by Under Secretary of the Army Joseph W. Westphal. "Gabby continues to be a great inspiration and a role model for her community, her state, the Army, the American people and members of Congress. She cared about soldiers and their families and worked hard on their behalf," Westphal said during a ceremony at the Pentagon on October 10, 2013. As a member of Congress from January 2007 to January 2012, she "was a dynamic leader, tirelessly working to ensure that our men and women in uniform had what they needed to keep our country safe," states her award citation. Among her many contributions, Westphal highlighted her support for Army funding in Iraq and Afghanistan and championing renewable energy solutions for the Army through the Giffords-Udall Department of Defense Energy Security Act of 2011. "...during her six years of House service, she helped to pass bills that reduced service members' tax burdens through the Earned Income Tax Credit and Child Care Tax Credit. She also advanced legislation that supported Soldiers with traumatic brain injury and post-traumatic stress disorder," Westphal noted. "Even after an assassination attempt on Giffords Jan. 8, 2011 in which she sustained a severe head injury, she further earned the respect of the military through her continued commitment to them," Westphal added. Following Westphal's remarks, U.S. Representative Ron Barber (D-AZ) lauded Giffords' efforts while serving in Congress and recognized her continued devotion and selfless service. "Gabby has inspired the nation with her courage, intrepid spirit and determination. Her courage has inspired more people than she'll ever know, not just in this country, but worldwide," said Barber. "Throughout her career and during her recovery, her husband, now-retired U.S. Navy Capt. Mark Kelly, was by her side supporting her," Westphal said. After the award was presented to Giffords, Kelly spoke about his wife's commitment to the U.S. Army and the nation. "She often visited soldiers at Fort Huachuca, which was in her district," he said. "She got to really understand the important work the intelligence community is doing there and made certain that their work to keep America safe was front and center in Congress." Kelly stated that during her visits with soldiers in Iraq and Afghanistan she saw the vulnerability of fuel supply lines, which were being targeted by the enemy. "The danger to soldiers was clear. Thousands were in harm's way, tasked with protecting the fragile fuel supply convoys. After two years of behind-the-scenes work with Army leaders, industry representatives and congressmen from both sides of the aisle, she developed a smarter energy strategy for the military," Kelly said. "During her recovery, she often looks to the brave service men and women who are recovering from their injuries as inspiration for her own recovery. And, as a military spouse, she gets it," Kelly concluded. "You too can make this world a better place. Be passionate. Be Courageous. Be your best," Giffords told the audience. **U.S. Army Decoration for Distinguished Civilian Service is presented by Under Secretary of the Army Joseph W. Westphal to Former U.S. Representative Gabby Giffords, October 10, 2013. For exceptionally distinguished public service from January 2007 to January 2012 while serving as a Member of Congress from the State of Arizona. During this period Congresswoman Giffords was a dynamic leader, tirelessly working to ensure that our men and women in uniform had what they needed to keep our country safe. She was influential in the development of the framework that introduced renewable energy at military installations and she strongly supported critical funding to modernize and sustain the Army. Her resilient and enduring commitment to care for those who defend our liberty led her to promote and campaign for enhancements in health care and quality of life improvements for Soldiers and their Families. Congresswoman Giffords' allegiance to Service men and women has enabled the Army to better prepare for new challenges and successfully meet national security threats during a turbulent period in American history. Congresswoman Giffords' patriotic and passionate service to our Nation is in keeping with the highest traditions of public service and reflects great credit on her, the United States Congress and the United States of America.